The Jefferson Award for Volunteerism. The Fort Pitt Society of the Daughters of the American Revolution, an all-female volunteer organization that owns and operates the Fort Pitt Block House, was honored as one of 47 local recipients of the Jefferson Awards at a reception held on May 6, 2014, at Heinz Field. 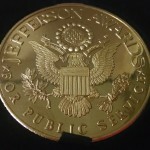 Each recipient received a two-inch bronze Jefferson Award medallion, commissioned by the Franklin Mint. Sponsored locally by the Pittsburgh Post-Gazette, Highmark, and BNY Mellon, The Jefferson Awards were originally started by former First Lady Jacqueline Kennedy Onassis, Senator Robert Taft Jr., and Sam Beard in 1972 as a “Nobel Prize” for public and community service, honoring those Americans who perform outstanding public service and inspire others to follow their example. The members of the Fort Pitt Society have protected, preserved, and promoted the Fort Pitt Block House since 1894. It is through their efforts that an important piece of Pittsburgh history still stands today, enabling future generations to know and appreciate our region’s role in American history. Congratulations to the Fort Pitt Society, 2013 winner of the Jefferson Awards! 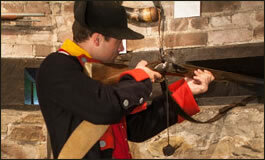 The gun loops of the Block House were made just wide enough so that a soldier could look through and fire his musket at anyone trying to attack. Each loophole slants downward, making it difficult for enemy fire to get into the building.